Used widely in hybridising, some of the better known cultivars include the well known ‘Hot Lips’, others include ‘Pink Blush’, ‘Cyclamen’ and ‘Huntington Red’. 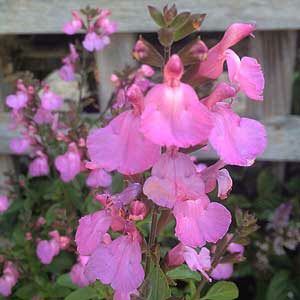 ‘Mesa Purple’ is a very bush variety, good purple flowers and excellent for containers. New varieties come onto the market each year and ‘Marshmallow’ with its white flowers, and ‘Pink Marshmallow’ with very attractive white and pink flowers are two. The pink flowering ‘Poppy Shan’ and the deeper red ‘Beetroot’ are others. Not all are readily available. Best in full sun to light shade and a well drained soil is essential. Problems with flowering are usually due to too much shade. It is best to mulch around the plants, although they are regarded as drought tolerant, they perform, and flower better with some moisture through summer. Grow them in the garden border in a mixed planting, or grow them in containers, either way these are an easy care plant that adds colour and character to the garden. 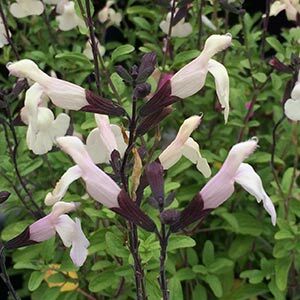 The dilemma with Salvia microphylla is that it flowers for many months and gardeners are reluctant to prune away the flowers. However over time it does become a a little leggy and really does need to be cut back. The best time to prune this species and the cultivars is in winter to early spring. You can cat back fairly hard in late winter, and you can use the pruning to propagate more plants. Don’t go to hard on the microphyllas, make sure you leave some green growth. Make sure the cuttings have at least 6 nodes and are around 15cm long. Simply use a regular potting mix and keep the cuttings warm and moist. They should start to grow new roots in around 4 weeks and will be ready to pot up or plant out about 8 weeks later.